Leonard Bernstein. Al Ravenna, World Telegram staff photographer. Library of Congress. 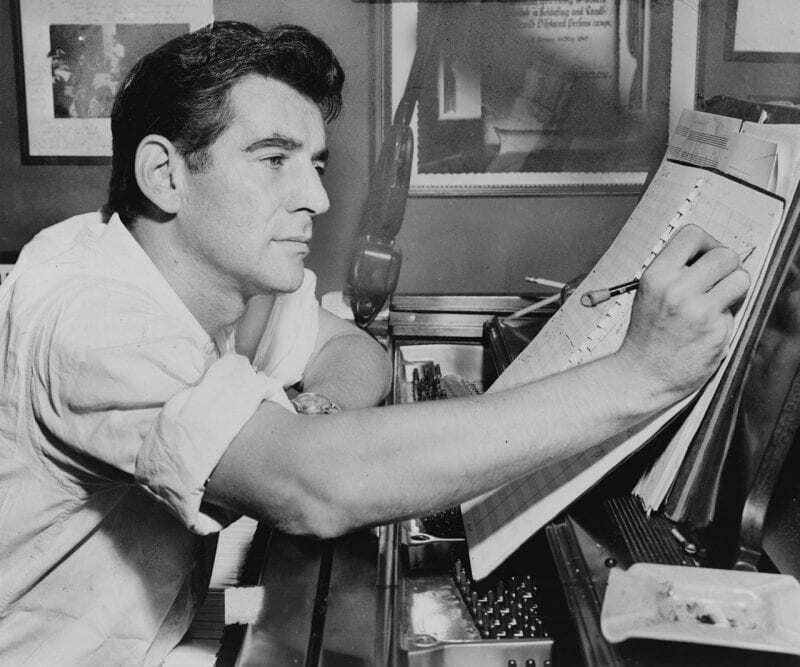 Happy Birthday to American composer and conductor, Leonard Bernstein! Today would be his 100th birthday year. This season LACO celebrates the centennial with super-star violinist Joshua Bell performing Bernstein’s Serenade (after Plato’s Symposium) at our inaugural orchestral series concert. A five movement concerto for violin, strings and percussion, Serenade is considered one of Bernstein’s most personal compositions. While Bernstein is well remembered for his music compositions and conducting, he became a well-known figure in the United States by giving television lectures on classical music. He made the first of his television lectures for the CBS arts program Omnibus in 1954. The live lecture, entitled “Beethoven’s Fifth Symphony”, involved Bernstein explaining the work with the aid of orchestra musicians and a giant page of the score covering the floor. The programs were shown in many countries around the world, often with Bernstein dubbed into other languages. He became as famous for his educational work in those concerts as for his conducting. Leonard Bernstein was also known for his outspoken political views and a strong desire to further social change. He translated his concern into action by supporting amnesty international’s work. As he went on in his career Bernstein would go on to fight for everything from the influences of “American Music” to nuclear disarmament. He was also known for his outspoken political views and his strong desire to further social change. Felicia Cohn Montealegre, Bernstein’s wife, was from Chile. In Chile, Between 1973 and 1977, thousands of political activists, their colleagues and their families were tortured, killed or “disappeared.” Bernstein not only cared deeply about persecution in Chile and elsewhere, but also translated his concern into action by supporting Amnesty International‘s work. Bernstein established the Felicia Montealegre Bernstein Fund of Amnesty International USA to provide much-needed support for human rights activists. The Fund was the first of its kind. As he went on in his career Bernstein would go on to fight for everything from the influences of “American Music” to nuclear disarmament. On December 25, 1989, Bernstein conducted Beethoven‘s Symphony No. 9 in East Berlin’s Schauspielhaus as part of a celebration of the fall of the Berlin Wall. He had conducted the same work in West Berlin the previous day. The orchestra consisted of musicians from both East and West Germany, plus the four occupying powers who had waged war against Germany in World War II: Great Britain, France, Russia and the United States. Bernstein is buried in New York, next to his wife and with a copy of Mahler’s Fifth lying across his heart.